If your employer has discriminated against you based on your age, you may have grounds to sue for compensation. Both federal and state laws prohibit discrimination on the basis of age. California law gives employees additional protections. The Los Angeles age discrimination attorneys at Gallenberg PC are dedicated to fighting for employees harmed by misconduct in the workplace. We offer a free confidential initial telephone intake to prospective clients. We also accept cases on a contingency fee basis. If you believe you were discriminated against at work, submit your case for review to an employment discrimination attorney. Call us in Burbank at (818) 237-5267, in Los Angeles at (213) 986-8432, or in Beverly Hills at (310) 295-1654 to tell us about your case. Or you can fill out our quick and easy online form; this is the fastest way to get your case screened by an attorney. Under the federal Age Discrimination in Employment Act (ADEA), employers cannot discriminate against job applicants and employees who are 40 years old or older on the basis of their age with regard to any aspect of employment, including termination, hiring, demotion, discharge, compensation, or the terms of employment. On the other hand, it is generally not illegal under federal law for an older worker to be preferred over a younger worker. It is also illegal under the ADEA to harass someone in a workplace due to his or her age. Harassment is illegal if it happens so often or is so severe that it creates a hostile work environment or if it results in an adverse employment action, such as termination. The California Fair Employment and Housing Act (FEHA) prohibits age discrimination against employees who are 40 years old or older as well. The ADEA only covers employers with 20 or more employees, while FEHA applies to employers with five or more employees. In most cases, FEHA is interpreted more broadly than the ADEA. Discrimination claims can be filed either with the state Department of Fair Employment and Housing (DFEH) or the Equal Employment Opportunity Commission (EEOC), which administers the ADEA. These agencies cooperate to process claims, so you can file with just one of them, as long as you indicate your intention to cross-file. Many different types of behavior may give rise to an age discrimination lawsuit. These include advertising specifically for employees within a certain younger age range, assigning demeaning tasks only to older workers, hiring a younger, less qualified job applicant because of his or her youth over another employee who is age 40 or older, implementing a strategy to hire younger workers, or implementing a layoff that disproportionately affects older people in the organization. Employees who are 40 or older do not need to prove that an employer intended to discriminate, only that there was a disparate impact produced by otherwise neutral employment policies. To make a disparate impact claim, a plaintiff needs to identify the particular practice that has a negative impact on older workers and show that the employer's action or decision was not based on a valid factor other than age. If you have been discriminated against in the workplace because you are 40 years old or older, you should seek legal representation. At Gallenberg PC, our Los Angeles age discrimination lawyers are dedicated advocates who can fight for your rights. Our firm represents workers in Southern California cities such as Burbank, Beverly Hills, Pasadena, Santa Monica, Van Nuys, Glendale, Downey, and Inglewood. 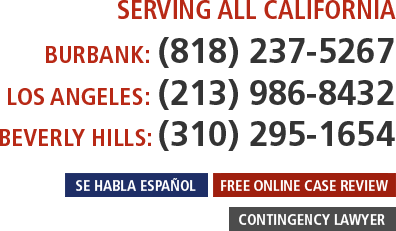 Call us in Burbank at (818) 237-5267, in Los Angeles at (213) 986-8432, or in Beverly Hills at (310) 295-1654, or submit your case for review using our online form. We can also assist people who need a wrongful termination attorney or guidance with any other claim related to a violation of their workplace rights.